Download "Final Exam 15 December 2006"
1 Eco 301 Name Final Exam 15 December points. Please write all answers in ink. You may use pencil and a straight edge to draw graphs. Allocate your time efficiently. Part 1 (10 points each) 1. As the quantity produced of a good increases, the social welfare generated by that good increases. False. This only takes consumer surplus into account. Beyond the competitive equilibrium, additional units of output have less value than the cost to make them. Thus, beyond the competitive equilibrium, social welfare declines as the quantity of a good increases. 2. Suppose that market demand for a good is Q = 480-2p. The marginal cost is MC = 2Q. Calculate the deadweight loss resulting from a monopoly in this market. First, solve for the competitive equilibrium by substituting MC for p in the demand equation and solve for Q. Q = 480-2(2Q) = 480-4Q. Rearranging yields 5Q = 480, or Q = 96. Since price equals marginal cost, p = 2(96) = 192. 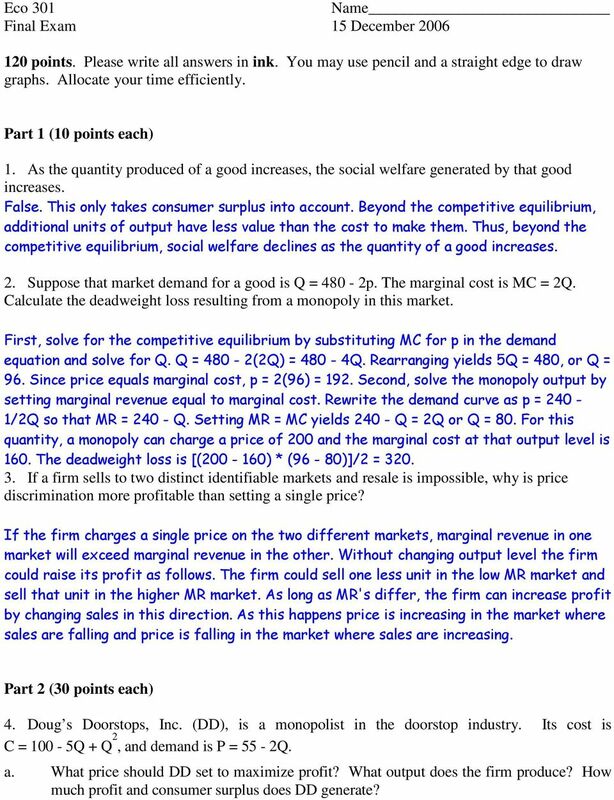 Second, solve the monopoly output by setting marginal revenue equal to marginal cost. Rewrite the demand curve as p = 240-1/2Q so that MR = Q. Setting MR = MC yields Q = 2Q or Q = 80. For this quantity, a monopoly can charge a price of 200 and the marginal cost at that output level is 160. The deadweight loss is [( ) * (96-80)]/2 = If a firm sells to two distinct identifiable markets and resale is impossible, why is price discrimination more profitable than setting a single price? If the firm charges a single price on the two different markets, marginal revenue in one market will exceed marginal revenue in the other. Without changing output level the firm could raise its profit as follows. The firm could sell one less unit in the low MR market and sell that unit in the higher MR market. As long as MR's differ, the firm can increase profit by changing sales in this direction. As this happens price is increasing in the market where sales are falling and price is falling in the market where sales are increasing. Part 2 (30 points each) 4. Doug s Doorstops, Inc. (DD), is a monopolist in the doorstop industry. Its cost is C = 100-5Q + Q 2, and demand is P = 55-2Q. a. What price should DD set to maximize profit? What output does the firm produce? How much profit and consumer surplus does DD generate? 2 To maximize profits, DD should equate marginal revenue and marginal cost. Given a demand of P = 55-2Q, we know that total revenue, PQ, is 55Q - 2Q 2. Marginal revenue is found by taking the first derivative of total revenue with respect to Q or: MR = dtr = 55 4 Q. dq Similarly, marginal cost is determined by taking the first derivative of the total cost function with respect to Q or: MC = dtc = 2Q 5. dq Equating MC and MR to determine the profit-maximizing quantity, 55-4Q = 2Q - 5, or Q = 10. Substituting Q = 10 into the demand equation to determine the profit-maximizing price: P = 55 - (2)(10) = $35. Profits are equal to total revenue minus total cost: π = (35)(10) - (100 - (5)(10) ) = $200. Consumer surplus is equal to one-half times the profit-maximizing quantity, 10, times the difference between the demand intercept (the maximum price anyone is willing to pay) and the monopoly price: CS = (0.5)(10)(55-35) = $100. b. What would output be if DD acted like a perfect competitor and set MC = P? What profit and consumer surplus would then be generated? In competition, profits are maximized at the point where price equals marginal cost, where price is given by the demand curve: 55-2Q = Q, or Q = 15. Substituting Q = 15 into the demand equation to determine the price: P = 55 - (2)(15) = $25. Profits are total revenue minus total cost or: Consumer surplus is π = (25)(15) - (100 - (5)(15) ) = $125. CS = (0.5)(55-25)(15) = $225. c. What is the deadweight loss from monopoly power in part (a)? 3 The deadweight loss is equal to the area below the demand curve, above the marginal cost curve, and between the quantities of 10 and 15, or numerically DWL = (0.5)(35-15)(15-10) = $50. d. Suppose the government, concerned about the high price of doorstops, sets a maximum price at $27. How does this affect price, quantity, consumer surplus, and DD s profit? What is the resulting deadweight loss? With the imposition of a price ceiling, the maximum price that DD may charge is $ Note that when a ceiling price is set above the competitive price the ceiling price is equal to marginal revenue for all levels of output sold up to the competitive level of output. Substitute the ceiling price of $27.00 into the demand equation to determine the effect on the equilibrium quantity sold: 27 = 55-2Q, or Q = 14. Consumer surplus is CS = (0.5)(55-27)(14) = $196. Profits are π = (27)(14) - (100 - (5)(14) ) = $152. The deadweight loss is $2.00 This is equivalent to a triangle of (0.5)(15-14)(27-23) = $2 e. Now suppose the government sets the maximum price at $23. How does this affect price, quantity, consumer surplus, DD s profit, and deadweight loss? With a ceiling price set below the competitive price, DD will decrease its output. 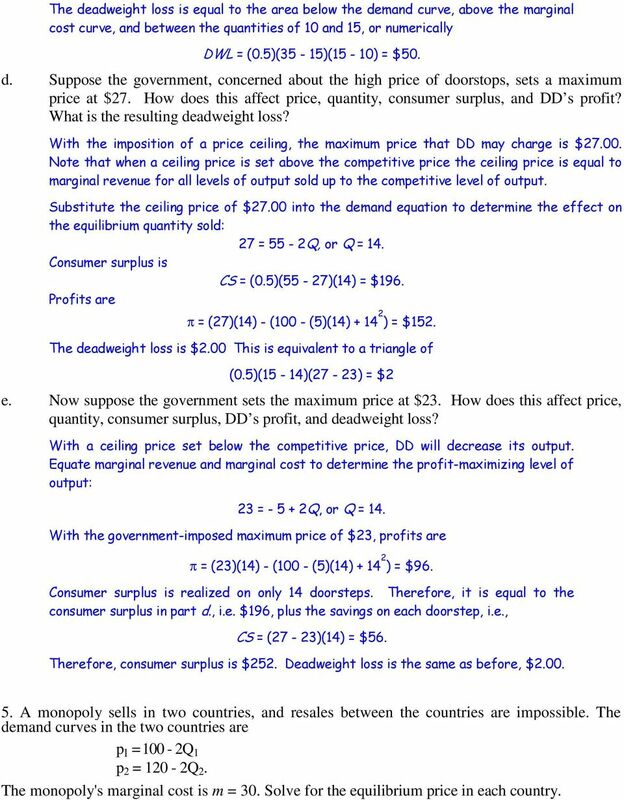 Equate marginal revenue and marginal cost to determine the profit-maximizing level of output: 23 = Q, or Q = 14. With the government-imposed maximum price of $23, profits are π = (23)(14) - (100 - (5)(14) ) = $96. Consumer surplus is realized on only 14 doorsteps. Therefore, it is equal to the consumer surplus in part d., i.e. $196, plus the savings on each doorstep, i.e., CS = (27-23)(14) = $56. Therefore, consumer surplus is $252. Deadweight loss is the same as before, $ A monopoly sells in two countries, and resales between the countries are impossible. The demand curves in the two countries are p 1 = 100-2Q 1 p 2 = 120-2Q 2. The monopoly's marginal cost is m = 30. Solve for the equilibrium price in each country. 7 b. A government regulatory agency sets a price ceiling of $7 per unit. What quantity will be produced, and what will the firm s profit be? What happens to the degree of monopoly power? To determine the effect of the price ceiling on the quantity produced, substitute the ceiling price into the demand equation. 7 = 11 - Q, or Q = 4,000. The monopolist will pick the price of $7 because it is the highest price that it can charge, and this price is still greater than the constant marginal cost of $6, resulting in positive monopoly profit. Profits are equal to total revenue minus total cost: The degree of monopoly power is: π = (7)(4,000) - (6)(4,000) = $4,000. 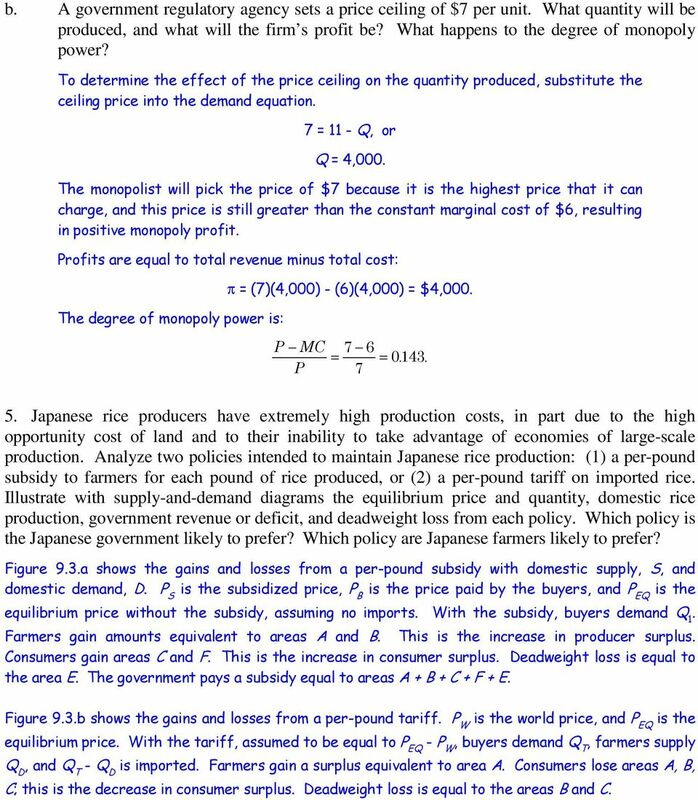 P MC P 7 = 6 = Japanese rice producers have extremely high production costs, in part due to the high opportunity cost of land and to their inability to take advantage of economies of large-scale production. 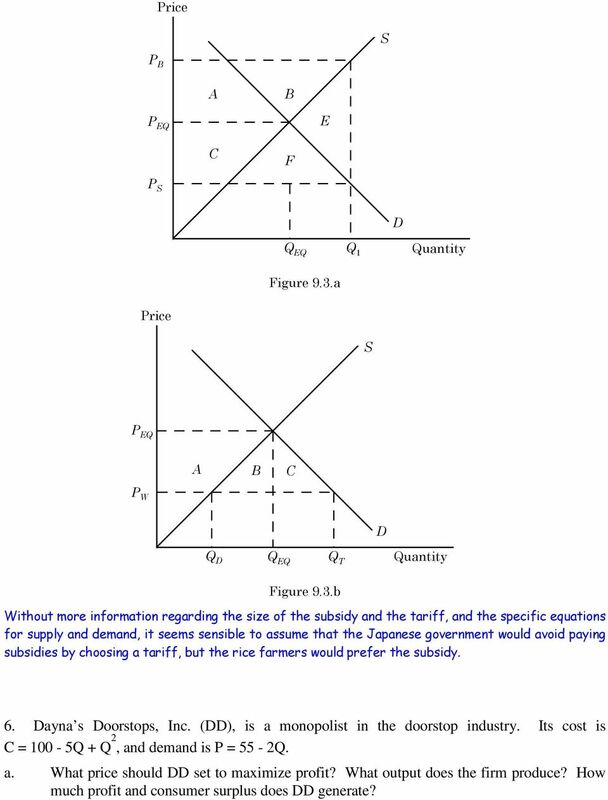 Analyze two policies intended to maintain Japanese rice production: (1) a per-pound subsidy to farmers for each pound of rice produced, or (2) a per-pound tariff on imported rice. Illustrate with supply-and-demand diagrams the equilibrium price and quantity, domestic rice production, government revenue or deficit, and deadweight loss from each policy. Which policy is the Japanese government likely to prefer? Which policy are Japanese farmers likely to prefer? Figure 9.3.a shows the gains and losses from a per-pound subsidy with domestic supply, S, and domestic demand, D. P S is the subsidized price, P B is the price paid by the buyers, and P EQ is the equilibrium price without the subsidy, assuming no imports. With the subsidy, buyers demand Q 1. Farmers gain amounts equivalent to areas A and B. This is the increase in producer surplus. Consumers gain areas C and F. This is the increase in consumer surplus. Deadweight loss is equal to the area E. The government pays a subsidy equal to areas A + B + C + F + E. Figure 9.3.b shows the gains and losses from a per-pound tariff. P W is the world price, and P EQ is the equilibrium price. With the tariff, assumed to be equal to P EQ - P W, buyers demand Q T, farmers supply Q D, and Q T - Q D is imported. Farmers gain a surplus equivalent to area A. Consumers lose areas A, B, C; this is the decrease in consumer surplus. Deadweight loss is equal to the areas B and C.
8 Price S P B A B P EQ E C F P S D Q EQ Q 1 Quantity Figure 9.3.a Price S P EQ A B C P W D Q D Q EQ Q T Quantity Figure 9.3.b Without more information regarding the size of the subsidy and the tariff, and the specific equations for supply and demand, it seems sensible to assume that the Japanese government would avoid paying subsidies by choosing a tariff, but the rice farmers would prefer the subsidy. 6. Dayna s Doorstops, Inc. (DD), is a monopolist in the doorstop industry. Its cost is C = 100-5Q + Q 2, and demand is P = 55-2Q. a. What price should DD set to maximize profit? What output does the firm produce? How much profit and consumer surplus does DD generate? 9 To maximize profits, DD should equate marginal revenue and marginal cost. Given a demand of P = 55-2Q, we know that total revenue, PQ, is 55Q - 2Q 2. 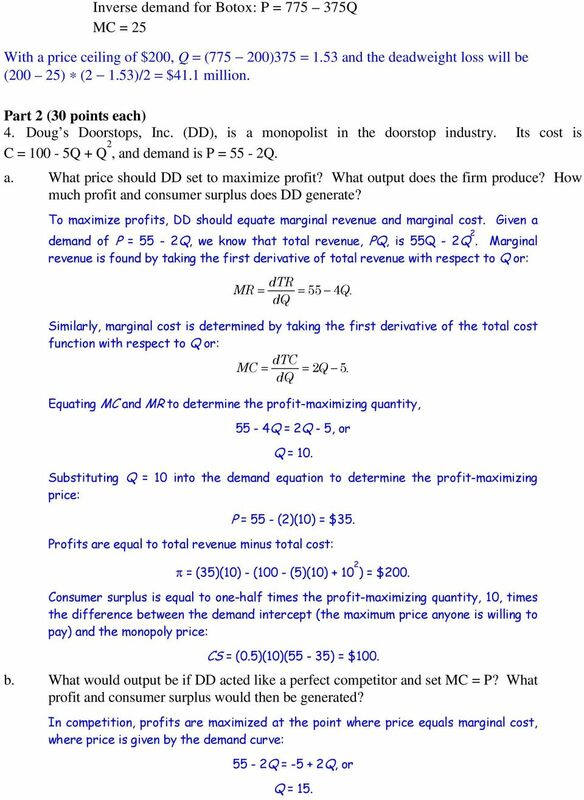 Marginal revenue is found by taking the first derivative of total revenue with respect to Q or: MR = dtr = 55 4 Q. dq Similarly, marginal cost is determined by taking the first derivative of the total cost function with respect to Q or: MC = dtc = 2Q 5. dq Equating MC and MR to determine the profit-maximizing quantity, 55-4Q = 2Q - 5, or Q = 10. 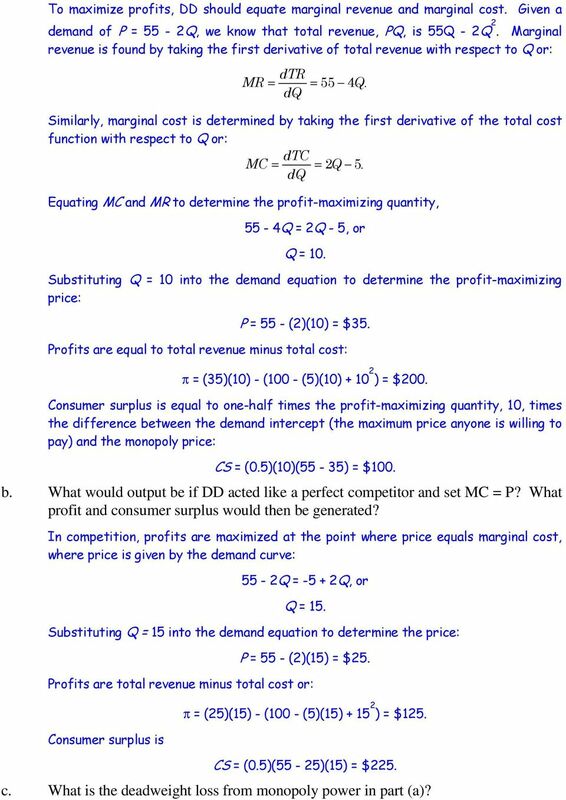 Substituting Q = 10 into the demand equation to determine the profit-maximizing price: P = 55 - (2)(10) = $35. Profits are equal to total revenue minus total cost: π = (35)(10) - (100 - (5)(10) ) = $200. Consumer surplus is equal to one-half times the profit-maximizing quantity, 10, times the difference between the demand intercept (the maximum price anyone is willing to pay) and the monopoly price: CS = (0.5)(10)(55-35) = $100. b. What would output be if DD acted like a perfect competitor and set MC = P? What profit and consumer surplus would then be generated? In competition, profits are maximized at the point where price equals marginal cost, where price is given by the demand curve: 55-2Q = Q, or Q = 15. Substituting Q = 15 into the demand equation to determine the price: P = 55 - (2)(15) = $25. Profits are total revenue minus total cost or: Consumer surplus is π = (25)(15) - (100 - (5)(15) ) = $125. CS = (0.5)(55-25)(15) = $225. c. What is the deadweight loss from monopoly power in part (a)? 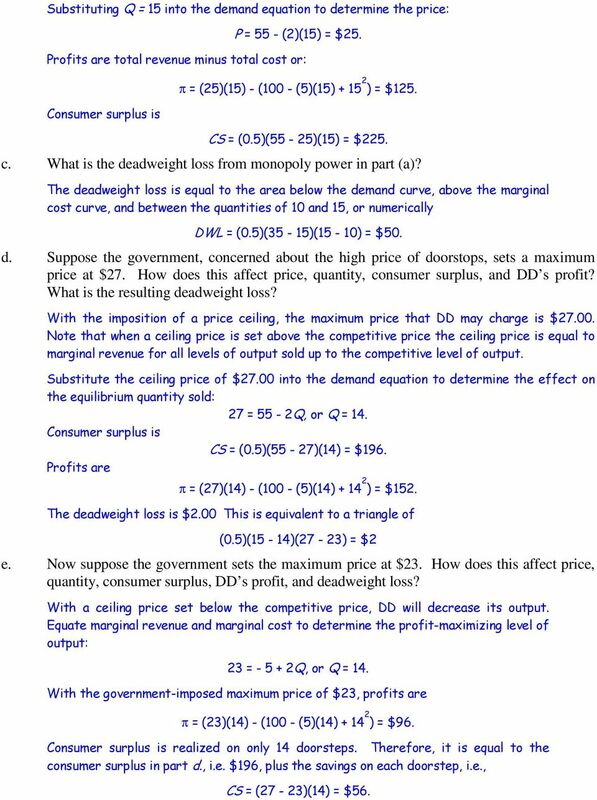 10 The deadweight loss is equal to the area below the demand curve, above the marginal cost curve, and between the quantities of 10 and 15, or numerically DWL = (0.5)(35-15)(15-10) = $50. d. Suppose the government, concerned about the high price of doorstops, sets a maximum price at $27. How does this affect price, quantity, consumer surplus, and DD s profit? What is the resulting deadweight loss? With the imposition of a price ceiling, the maximum price that DD may charge is $ Note that when a ceiling price is set above the competitive price the ceiling price is equal to marginal revenue for all levels of output sold up to the competitive level of output. Substitute the ceiling price of $27.00 into the demand equation to determine the effect on the equilibrium quantity sold: 27 = 55-2Q, or Q = 14. Consumer surplus is CS = (0.5)(55-27)(14) = $196. Profits are π = (27)(14) - (100 - (5)(14) ) = $152. The deadweight loss is $2.00 This is equivalent to a triangle of (0.5)(15-14)(27-23) = $2 e. Now suppose the government sets the maximum price at $23. How does this affect price, quantity, consumer surplus, DD s profit, and deadweight loss? With a ceiling price set below the competitive price, DD will decrease its output. 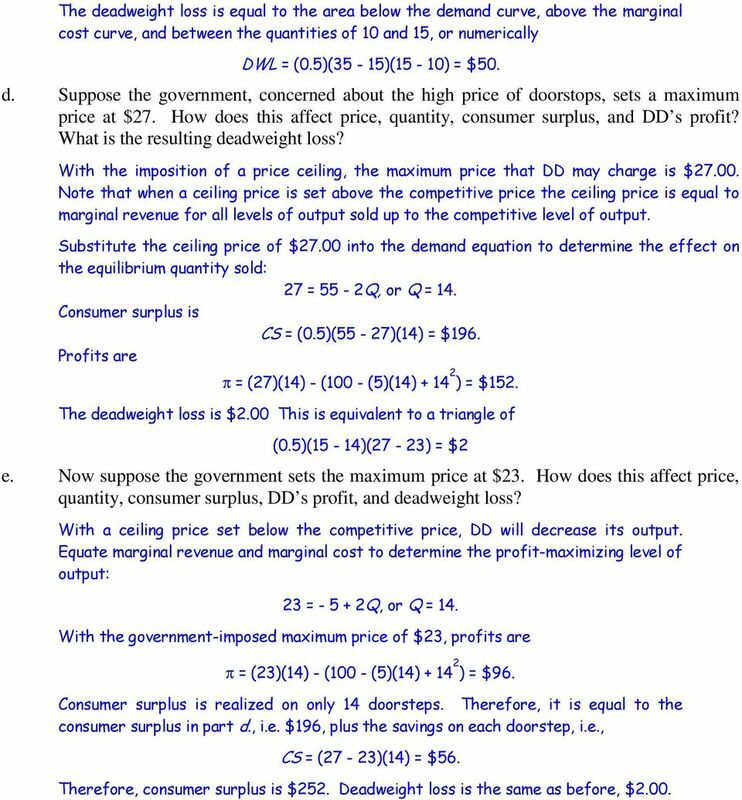 Equate marginal revenue and marginal cost to determine the profit-maximizing level of output: 23 = Q, or Q = 14. With the government-imposed maximum price of $23, profits are π = (23)(14) - (100 - (5)(14) ) = $96. Consumer surplus is realized on only 14 doorsteps. Therefore, it is equal to the consumer surplus in part d., i.e. $196, plus the savings on each doorstep, i.e., CS = (27-23)(14) = $56. Therefore, consumer surplus is $252. Deadweight loss is the same as before, $2.00. 11 Eco 301 Name Final Exam 14 December points. Please write all answers in ink. You may use pencil and a straight edge to draw graphs. Allocate your time efficiently. Part 1 (10 points each) 1. As the quantity produced of a good increases, the social welfare generated by that good increases. False. This only takes consumer surplus into account. Beyond the competitive equilibrium, additional units of output have less value than the cost to make them. Thus, beyond the competitive equilibrium, social welfare declines as the quantity of a good increases. 2. By 1996, the world price for raw sugar, $ per pound, was about half the domestic price, per pound, because of quotas and tariffs on sugar imports. As a consequence, American-made corn sweetener, which costs $1.20 a pound to make, can be profitably sold. Archer-Daniels-Midland made an estimated profit of $290 million in 1994 from selling corn sweetener. The U.S. Commerce Department says that the quotas and price support reduce American welfare by about $3 billion a year. If so, each dollar of Archer-Daniels-Midland's profit costs Americans about $10. 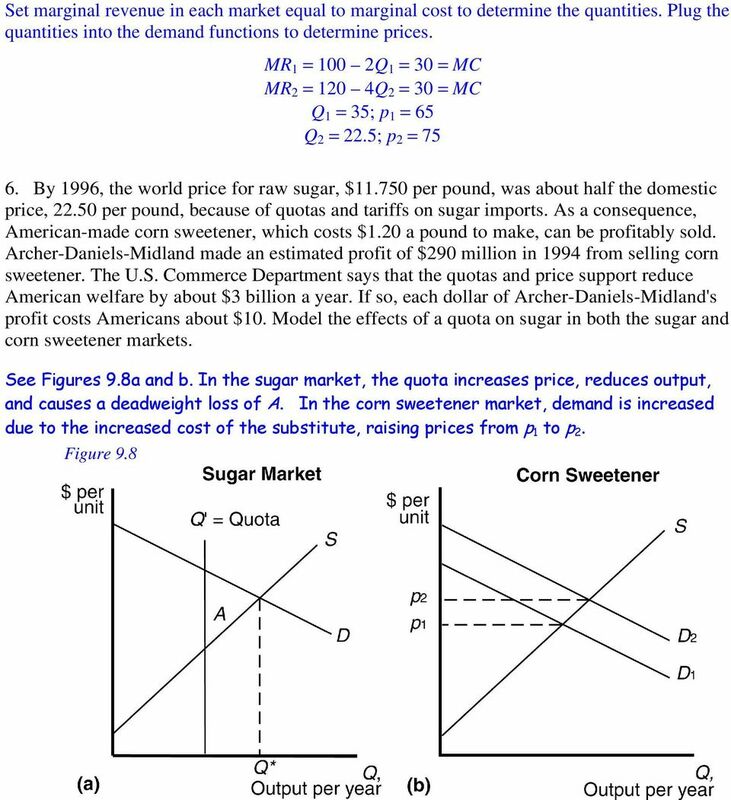 Model the effects of a quota on sugar in both the sugar and corn sweetener markets. See Figures 9.8a and b. 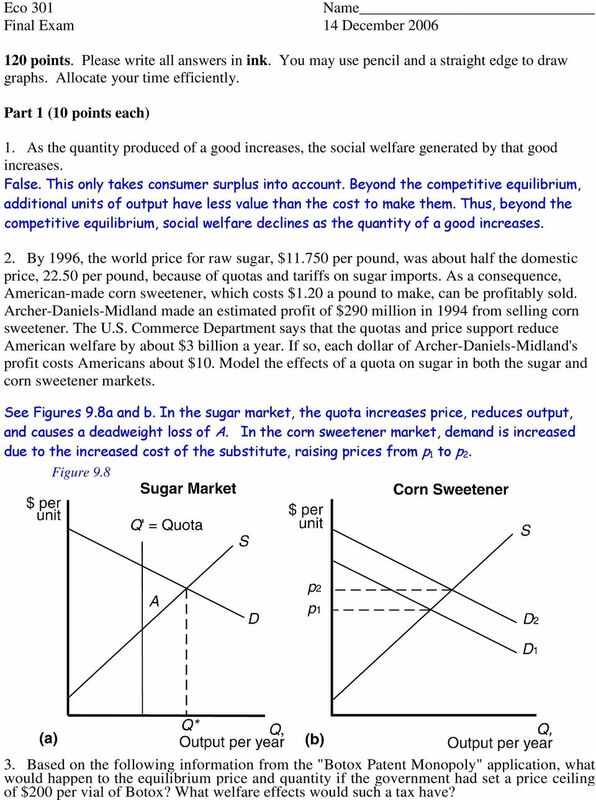 In the sugar market, the quota increases price, reduces output, and causes a deadweight loss of A. In the corn sweetener market, demand is increased due to the increased cost of the substitute, raising prices from p 1 to p 2. Figure Based on the following information from the "Botox Patent Monopoly" application, what would happen to the equilibrium price and quantity if the government had set a price ceiling of $200 per vial of Botox? What welfare effects would such a tax have? 12 Inverse demand for Botox: P = Q MC = 25 With a price ceiling of $200, Q = ( )375 = 1.53 and the deadweight loss will be (200 25) * (2 1.53)/2 = $41.1 million. Part 2 (30 points each) 4. Doug s Doorstops, Inc. (DD), is a monopolist in the doorstop industry. Its cost is C = 100-5Q + Q 2, and demand is P = 55-2Q. a. What price should DD set to maximize profit? What output does the firm produce? How much profit and consumer surplus does DD generate? To maximize profits, DD should equate marginal revenue and marginal cost. Given a demand of P = 55-2Q, we know that total revenue, PQ, is 55Q - 2Q 2. Marginal revenue is found by taking the first derivative of total revenue with respect to Q or: MR = dtr = 55 4 Q. dq Similarly, marginal cost is determined by taking the first derivative of the total cost function with respect to Q or: MC = dtc = 2Q 5. dq Equating MC and MR to determine the profit-maximizing quantity, 55-4Q = 2Q - 5, or Q = 10. Substituting Q = 10 into the demand equation to determine the profit-maximizing price: P = 55 - (2)(10) = $35. Profits are equal to total revenue minus total cost: π = (35)(10) - (100 - (5)(10) ) = $200. Consumer surplus is equal to one-half times the profit-maximizing quantity, 10, times the difference between the demand intercept (the maximum price anyone is willing to pay) and the monopoly price: CS = (0.5)(10)(55-35) = $100. b. What would output be if DD acted like a perfect competitor and set MC = P? What profit and consumer surplus would then be generated? In competition, profits are maximized at the point where price equals marginal cost, where price is given by the demand curve: 55-2Q = Q, or Q = 15. 13 Substituting Q = 15 into the demand equation to determine the price: P = 55 - (2)(15) = $25. Profits are total revenue minus total cost or: Consumer surplus is π = (25)(15) - (100 - (5)(15) ) = $125. CS = (0.5)(55-25)(15) = $225. c. What is the deadweight loss from monopoly power in part (a)? The deadweight loss is equal to the area below the demand curve, above the marginal cost curve, and between the quantities of 10 and 15, or numerically DWL = (0.5)(35-15)(15-10) = $50. d. Suppose the government, concerned about the high price of doorstops, sets a maximum price at $27. How does this affect price, quantity, consumer surplus, and DD s profit? What is the resulting deadweight loss? With the imposition of a price ceiling, the maximum price that DD may charge is $ Note that when a ceiling price is set above the competitive price the ceiling price is equal to marginal revenue for all levels of output sold up to the competitive level of output. Substitute the ceiling price of $27.00 into the demand equation to determine the effect on the equilibrium quantity sold: 27 = 55-2Q, or Q = 14. Consumer surplus is CS = (0.5)(55-27)(14) = $196. Profits are π = (27)(14) - (100 - (5)(14) ) = $152. The deadweight loss is $2.00 This is equivalent to a triangle of (0.5)(15-14)(27-23) = $2 e. Now suppose the government sets the maximum price at $23. How does this affect price, quantity, consumer surplus, DD s profit, and deadweight loss? With a ceiling price set below the competitive price, DD will decrease its output. 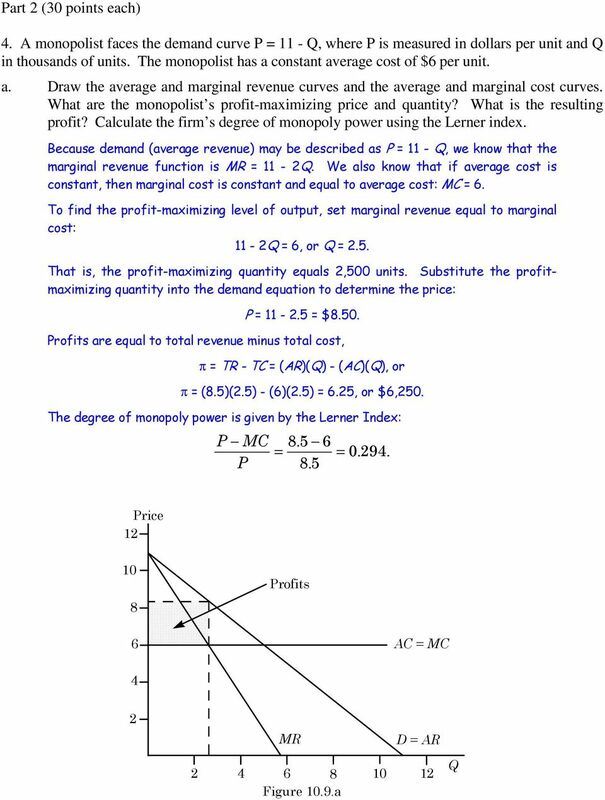 Equate marginal revenue and marginal cost to determine the profit-maximizing level of output: 23 = Q, or Q = 14. With the government-imposed maximum price of $23, profits are π = (23)(14) - (100 - (5)(14) ) = $96. Consumer surplus is realized on only 14 doorsteps. Therefore, it is equal to the consumer surplus in part d., i.e. $196, plus the savings on each doorstep, i.e., CS = (27-23)(14) = $56. 14 Therefore, consumer surplus is $252. Deadweight loss is the same as before, $ Suppose anyone with a driver's license is capable of supplying one trip from the airport to the downtown business center on any given day. The long-run supply curve of such trips is horizontal at p = $50, which is the average cost of such trips. Suppose daily demand is Q = p. Calculate the change in consumer surplus, producer surplus and social welfare if the city government requires those people supplying such trips to possess a special license, and the government will issue only 300 licenses. The competitive equilibrium is Q = (10 * 50) = 500. With the supply restriction of 300, price becomes $70. The loss in social welfare is [(70-50) * ( )]/2 = $2,000. Producers gain (70-50) * 300 = $6,000. Consumers lose $6,000 + $2,000 = $8, The domestic demand curve, domestic supply curve, and world supply curves for a good are given in the figure below. All the curves are linear. Initially, the country allows imports. Then imports are banned. 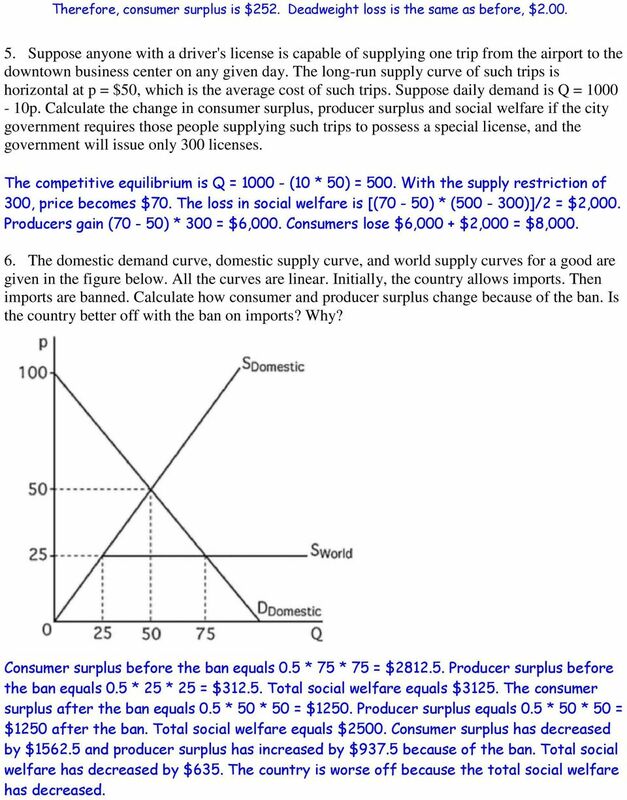 Calculate how consumer and producer surplus change because of the ban. Is the country better off with the ban on imports? Why? Consumer surplus before the ban equals 0.5 * 75 * 75 = $ Producer surplus before the ban equals 0.5 * 25 * 25 = $ Total social welfare equals $3125. The consumer surplus after the ban equals 0.5 * 50 * 50 = $1250. Producer surplus equals 0.5 * 50 * 50 = $1250 after the ban. Total social welfare equals $2500. Consumer surplus has decreased by $ and producer surplus has increased by $937.5 because of the ban. Total social welfare has decreased by $635. The country is worse off because the total social welfare has decreased. 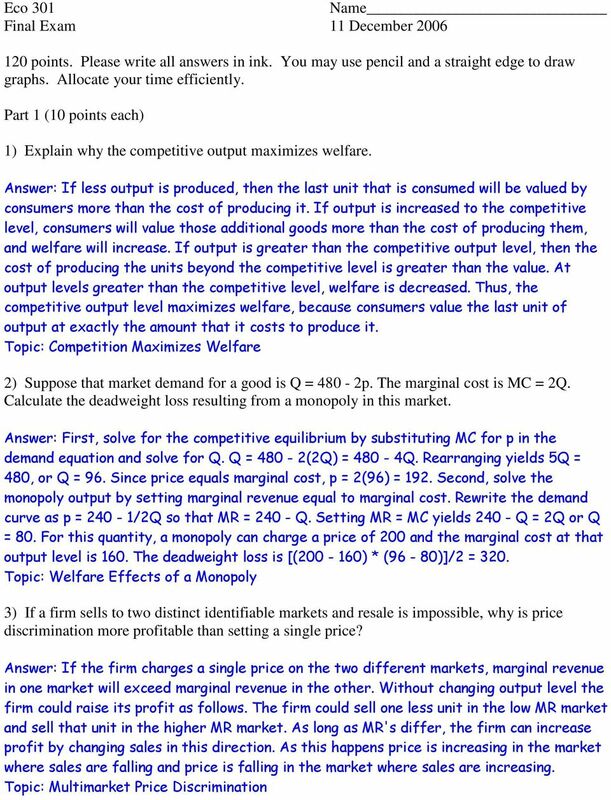 Chapter 10 Market Power: Monopoly and Monopsony Review Questions 1. A monopolist is producing at a point at which marginal cost exceeds marginal revenue. How should it adjust its output to increase profit? Chapter 12 Pricing and Advertising 12.1 Why and How Firms Price Why does Disneyworld charge local residents $369 for an annual pass and out-of-towners $489? Why are airline fares less if you book in advance? Defn. Market power the abiliby of a single economic actor (or small group of actors) to have a substantial influence on market prices. of the linear demand curve. Show that moving to higher levels of output along the demand curve increases elasticity. Review Question - Chapter 7. MULTIPLE CHOICE. Choose the one alternative that best completes the statement or answers the question.